At the end of my last post I mentioned that the multiplayer had not been functioning as intended, upon its Xbox One launch. While this made people very unhappy and could likely have been solved with a beta test on the console. It is with great pleasure I bring you the news that the games multiplayer is up and functional for Xbox Users. For anyone who already plays the game however that is old news, so lets talk about the Multiplayer in Monster Hunter World. The premise is simple, hunting is better done as a squad; bring three of your friends with you to hunt the monster that’s been giving you jip and see how smug it is then. There are however a few technical things that while fairly obvious after a little exploration are worth laying out for first time players. 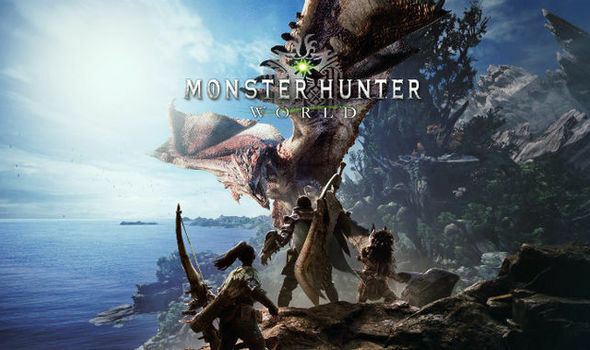 (If you have already got a grasp on getting into Multiplayer then check out my First impressions of Monster Hunter World Multiplayer here,) There are two different ways to play with other people, one is the SOS flare and the other, is with people in your online session, whether irl friends or recently discovered hunters. We’ll look at SOS flares first. When you send your SOS flare up using the menu, you can expect a wait, reinforcements will not be immediate. As best I can tell the game takes a couple of minutes to post up your quest on the SOS board and reconcile settings to accommodate players joining you on the fly. In my experience, getting help this way is much like waiting for a bus, never there when you need them most and then all show up at once. A good example of this was my fight against the Diabolos, I’d died last time I fought it, sent up an SOS flare and had for all intents and purposes soloed the Monster before three players spawned in for some loot, a laugh and in the case of one rambunctious hunter wielding an Insect Glaive, a ride Alton Towers would kill to have. This isn’t to say this is an ineffective method of getting support however as players do respond and the majority of the time, once they are there, they are extremely helpful. Well what if I’m the helpful type? I hear myself ask. Well then you can go help, simply by selecting join a quest, SOS flares and picking the quest that takes your fancy. It’s helpful to bear in mind that this can be a fun way to break up the monotony of killing that Monster that simply refuses to drop the loot you want. You can also if you decide one players help is enough cancel the flare at any time using your menu. SOS Flares are the only form of multiplayer I know of that allow you to interact with players in other sessions. The other and perhaps easier way of doing things, is to arrange a party within your online session. Now if you are a player, whose been offline or playing solo until this point, there probably hasn’t been much point in going to the Gathering Hub, but if you join or create an online session for you and your friends this area becomes more important. While never strictly necessary as all of your questing needs can be attended to at the quest boards in Astera, the Gathering Hub is the only place you will be able to see other player characters, when not on a hunt or expedition. Regardless of if you are in the Gathering Hub or outside the smithy, the way you do Multiplayer in session is the same. You post a quest, this quest will then be posted to anyone eligible to join and will remain there, so that someone can come and join you when they finish up their quest. If anyone chooses to join, via the available quests section, they will show up as preparing, when they are prepared you will set off as a party. There is a third type of session you can create, A Squad Session, this session is one that is specific to your squad, who are for all intents and purposes your guild. This is an easy way to track which of your friends is playing, so you can go flame them while you hunt together. But is the Multiplayer experience worth it. For players of all experience levels, yes, yes it is. Solo hunting is fun for a challenge, but with new monsters or creatures you might be struggling with Co-op play is worth its weight in monster parts. Not only can having a party make for laughs and shared joy when something epic happens, communication gives you an edge in how you approach and co-ordinate your strikes on a monster. With each weapon being so drastically different this can be crucial in terms of picking weapons before a hunt, and the style you will need to adopt to hunt successfully as a party. Trapping, mounting, ambushing, is both more easily achieved and generally more successful in multiplayer hunts. Are there any downsides? Well, players can screw over your hunt by getting knocked out. Although to be honest that’s negligible as a complaint, because if the game wasn’t challenging it wouldn’t be fun. I do have a more serious gripe with the game and that is that you have to wait until people have seen cut scenes to join them, which can lead to tedious waits before you can join your friends if you are helping them with a hunt they haven’t done before. All in all, the downsides are minimal and the potential upsides worth it. If you haven’t already I would highly recommend you give it a go!